Midland Express, November 3rd 2014. Newstead Railway Station will be transformed into a thriving arts space, business and community hub under the State Government’s Community Use of Vacant Rail Buildings Program. Parliamentary Secretary for Transport, Gary Blackwood, visited Newstead last Tuesday to make the announcement, which will give the disused building a new lease of life. Mount Alexander Shire Council has taken on a head lease for the old station building, which will be converted into a thriving community space under a major rebuilding program. The program is managed by VicTrack, custodial owner of Victoria’s rail land and assets, on behalf of Public Transport Victoria. A range of local community groups will be the building’s new tenants in a sub-lease arrangement with the council. The arts and community groups will offer a multipurpose gallery, exhibition and performance space, along with a business hub and flexible community meeting and event space. 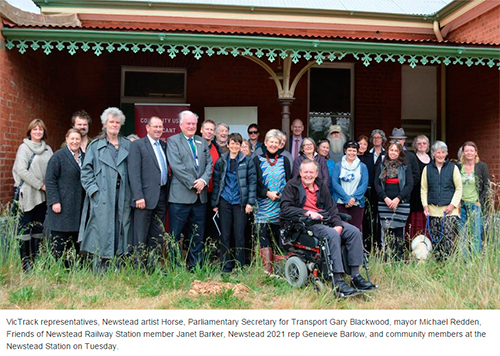 Mr Blackwood said the Victorian Government believes that Newstead Railway Station and many other railway buildings around the state have been unused and unloved for far too long. “Through this innovative partnership between the Newstead community and the Victorian Government, Newstead Station will be open for business after decades in disrepair,” Mr Blackwood said. “A dedicated group of Newstead residents have worked hard over many months to find a viable use for their station,” he said. Work to refurbish the station will get underway in early 2015 and it is expected tenants will be able to be able to take occupancy by around April. Mount Alexander Shire mayor Michael Redden said the local project will add great value to Newstead. “A number of creative professionals and small businesses currently operate without a proper home in the local area and the spaces provided at the station will promote networking and the development of expertise within the community,” he said.